Toyota's net income for the 12 months ended March 31 rose 95 percent to 408 billion yen (about $5.1 billion). TOKYO -- Japan's devastating earthquake and tsunami hammered fourth-quarter profits at Toyota Motor Corp., slashing net income 77 percent amid production stops and sliding sales. But the world's biggest automaker said recovery is progressing faster than anticipated and that output will start returning to normal in June, up to two months earlier than envisioned in April. Europe emerged as a bright spot in the fourth quarter, despite a sales slowdown. Toyota sold 62,000 fewer vehicles in Europe in the 2010-2011 financial year ending March 31, but operating profit in the region rose 46 percent from a loss of 13.1 billion yen ($161 million) in 2010 to a gain of 33 billion yen ($406 million) in 2011. Europe's fourth-quarter operating profit surged to 19.8 billion yen ($244 million) in the three months ended March 31, compared with an operating profit of 7.0 billion yen ($86 million) a year earlier. Toyota's net income plunged to 25.4 billion yen ($306.5 million) in the fiscal fourth quarter ended March 31, from 112.2 billion yen ($1.35 billion) a year earlier, the company announced May 11. The net income was much lower than the 104 billion yen ($1.26 billion) average of four analyst estimates compiled by Bloomberg in the past four week. Revenue fell 12 percent to 4.64 trillion yen ($56.0 billion), from 5.28 trillion yen ($63.7 billion). Global sales slid 12 percent to 1.79 million units in the quarter, with North America moving just 483,000 vehicles, compared with 551,000 the year before. Toyota is still reeling from the impact of the March 11 earthquake and tsunami that slammed northeastern Japan and paralyzed the country's auto industry. Like its Japanese rivals, Toyota has had to shutter assembly plants in Japan and cut production overseas for a lack of parts. Toyota declined to give a forecast for the current fiscal year because of lingering uncertainties. But the quake could cost Toyota its global sales crown, pushing it behind General Motors Co., currently No. 2, and possibly even No. 3 Volkswagen AG. The quake has cost Toyota 170,000 units in lost sales, noted Executive Vice President Satoshi Ozawa. Toyota also booked a special 110 billion yen ($1.33 billion) charge for quake costs. 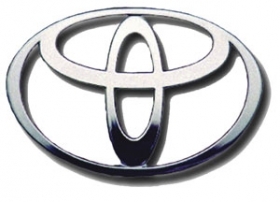 President Akio Toyoda, grandson of the automaker's founder, said the company is rebounding faster than expected. Assembly plants at home and abroad will see production pick up in June, with Toyota's global output averaging about 70 percent of pre-quake levels then, he said. "Our efforts at production normalization are progressing faster than announced," Toyoda said. "We are now confident that our vehicle production will recover to about 70 percent of our normal production volume on a worldwide basis from June," he said. Just three weeks ago, Toyoda said assembly plants in Japan would begin rebounding in July, with U.S. and other overseas plants seeing the up tick in August. Meanwhile, Toyota has also whittled down its list of at-risk parts to 30 components, from about 150 last month. Despite the bumped-up schedule, Toyoda said normal production is still expected to be achieved in November or December – in line with last month's outlook. Casting doubt on the recovery is uncertainty about supply of electricity during the hot summer months, because several key nuclear power plants are expected to be offline. "There is still a series of aftershocks, so we can't get overly confident," Toyoda added. In Japan, regional operating loss slumped to 188.0 billion yen ($2.27 billion) in the quarter, widening a loss of 1.5 billion yen ($18.1 million) a year earlier. The yen's steady climb in value against other currencies, including the dollar and euro, also made export-dependent domestic operations less profitable. For the full fiscal year, net income at Toyota nearly doubled to 408.1 billion yen ($4.93 billion), from 209.4 billion yen ($2.53 billion) the year before. Operating profit surged to 468.2 billion yen ($5.65 billion), from 147.5 billion yen ($1.78 billion). Global sales advanced just 1 percent to 7.31 million units, from 7.24 million.